I have one more guest post for you today! I'm back from Connecticut, but I'm sick and jet lagged, so I figured I'd let a friend take care of my blog one more time before I get back in front of the camera. Today, I'm handing it over to Priya, one of my very first blogger friends. Priya and I clicked immediately and instantly bonded over a shared similar style, personalities, and sense of humor. She's one of those people who always makes me smile when I read her blog, and I am positive that whenever we finally meet in person, it will feel like we've known each other forever. I know you'll enjoy her as much I do. Though Elana & I both hail from the great, golden state of California, I am currently living in Nashville, which means: the weather is not perfect all the time, and Spring is truly a gem of a season! Spring in Nashville means sunshine without humidity, drinking on patios again, and the most gorgeous blooms wherever you look! That was literally the entire inspiration behind these photos, these beautiful trees that were honest-to-goodness in full bloom just outside my office. Though the entire ensemb really aligned with the "Spring" theme nicely- booties, bare legs, a full skirt, and a jacket layer for the cooler morning. I can't decide if it's too wild (definitely not something I would purchase myself!) but isn't that what they say about trends, try them in small doses on accessories first? Is calf hair a current trend? Is that even what this is called?? So many questions. Well, I hope Spring has sprung wherever you are, and thanks Elana for having me today! It's already humid in Georgia! I definitely understand enjoying the non-humidity while you can. 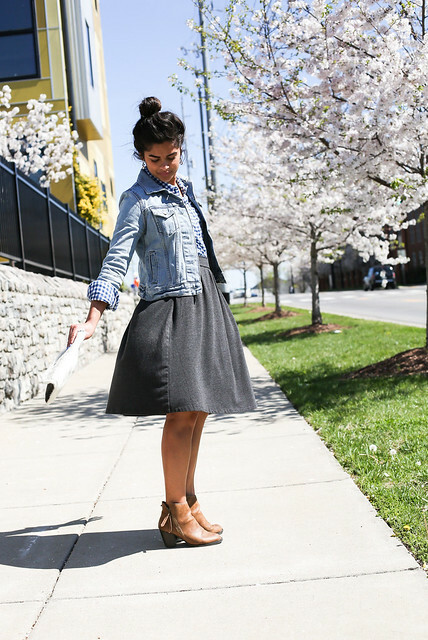 I'm loving this cute spring-y guest post. 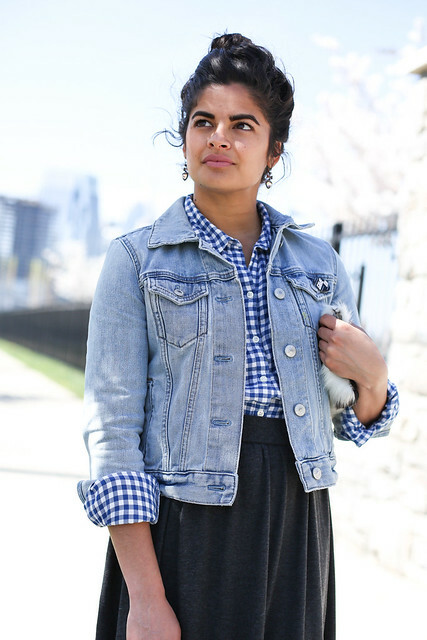 The jean jacket looks perfect with your gingham shirt. Oh, Priya- I'm loving this classic look so much.